"This little electric grill is much-loved by users who prefer an electric grill." "It offers 240 square inches of grilling space on a nonstick cooking surface." "Since this uses infrared heat, it heats faster and more evenly, and the chance of flare-ups is reduced." "Indoor grilling couldn’t be easier with this electric grill that’s perfect for steaks, burgers, vegetables, and more." "It has three adjustable height settings so you can use the lower settings for more delicate items or you can open it completely flat for 'BBQ mode'." "You won't have to wait a long time for it to heat up either—it can reach up to 600 degrees in about 10 minutes." "An indoor grill with 240 square inches of cooking space, and you can turn the plates over to use it as a griddle to cook your favorite breakfast foods." "Has a 1500-watt heating element that cooks your food on 176 square inches of cooking space." Weber has become synonymous with charcoal grills and their iconic kettle grills, this little electric grill is much-loved by users who prefer an electric grill. It has 189 square inches of cooking space on porcelain-enameled cast iron cooking grates for results much like a gas grill, but with the ease of cooking with electricity. The body and lid are made from aluminum and the frame is glass-reinforced nylon, reducing the weight of the grill to make it easy to carry out to the balcony or to store when it’s not in use. The catch pan collects grease and food drippings and is removable for easy disposal when cooking is done. See more reviews of our favorite Weber grills for purchase. If you want a grill that is safe for outdoor use as well as indoor use, and you don’t want to break the budget, this grill may be the perfect option for you. This grill can be removed from the stand for countertop use indoors, or you can use it with the stand when you don’t have spare counter space in the kitchen. It offers 240 square inches of grilling space on a nonstick cooking surface. There are five temperature settings, so you can cook everything from delicate seafood to sturdy burgers, and the solid grill surface means you’ll never have flare-ups from drippings hitting the heat source. The grilling surface is slightly sloped, so drippings drain away for easy cleaning. When cooking is done, the grill plate is removable so you can wash it. If you miss your outdoor gas or charcoal grill but can’t have live fire, this infrared grill may be the next best thing. It looks like a gas grill, complete with side tables to hold your plates and sauces, and has a stand with wheels that makes it easy to move around. A wire tray under the grill gives you a little extra storage space while you cook. This has 240 square inches of cooking space, plus an additional 80 inches on a warming rack, so you can keep food warm for serving or heat up your burger buns. A temperature gauge in the lid lets you monitor the grill temperature at a glance. Since this uses infrared heat, it heats faster and more evenly, and the chance of flare-ups is reduced, while still giving you impressive cooking performance. The cooking grates are porcelain-coated cast iron that keeps food from sticking and they're super easy to clean. Temperature is controlled with a large center knob, so you can adjust from high heat to low with ease. Indoor grilling couldn’t be easier with this electric grill that’s perfect for steaks, burgers, vegetables, and more. The ceramic grilling surface is a generous 12 1/2 inches by 9 1/4 inches, and the overall size is just under 19 by 13 inches, so it will store easily when it’s not in use. Large side handles make it easy to move, and they stay cool when you’re cooking so you can move it even when the grill is hot. This has variable heat control, so you can adjust it any way you like from 176 to 410 degrees, for delicate foods or for searing burgers. Fats and juices drain away during cooking for collection in a drip tray, and when cooking is done, the drip tray is easily removable and dishwasher safe. Read more reviews of best indoor grills available to purchase online. There’s not a lot to dislike about this grill. It has three adjustable height settings so you can use the lower settings for more delicate items (sandwiches that you don't want completely flattened) or you can open it completely flat for “BBQ mode.” There is one flat plate and one ribbed plate, and you can use either one on the top or bottom. The cooking plates have a nonstick coating, so food won’t stick, even if you’re using gooey sauces. Both plates can be adjusted with a tilt so juices and fats drain, or they can be set completely flat for cooking eggs or pancakes when you’re using the griddle surface. The temperature is also adjustable (it can be adjusted from 310 to 450 degrees), so you can alter it depending on the food you are cooking. A drip tray collects all the drippings for easy disposal when cooking is done, and the cooking plates are removable and dishwasher safe. Check out our other reviews of best portable grills available on the market today. This elegant and compact stainless steel grill achieves the high heat you want for searing foods and you won't have to wait a long time for it to heat up either—it can reach up to 600 degrees in about 10 minutes. The heating element is in direct contact with the cooking surface so there’s little heat loss. A water pan in the bottom of the grill collects drippings and eliminates flare-ups during cooking. The company offers a sturdy but somewhat expensive reusable pan for separate purchase, or disposable foil pans can be used. However, users caution that water is required or the drippings can catch fire. When it’s time to clean up, both the grill grate and the lid are dishwasher safe. Users say that the reusable pan is easy to clean and easier to remove than store bought foil pans. Apartment living doesn’t give you a lot of space for appliances, so it’s important to invest in versatile gadgets that will get a lot of use. If you're in the market for a device that can sear meats, melt sandwiches, and cook breakfast foods, this is a great option. Fully open, it’s an indoor grill with 240 square inches of cooking space, and you can turn the plates over to use it as a griddle to cook your favorite breakfast foods in the morning. With the lid closed, you can use it as a contact grill or panini press, or leave the lid just a little higher to melt the cheese on your pizza slice or open-faced cheese sandwich. This has two separate temperature controls, and you can crank it up to 500 degrees to sear food for up to two minutes at a time and can cook continuously at up to 450 degrees. An integrated drip tray neatly collects drippings and juices, and a scraping tool helps remove stuck food on the grates. The plates, drip tray, and scraper are all dishwasher safe for easy cleaning. For a versatile electric grill that can sear meats to perfection, we love the Easy Street Lock 'N Go Electric Grill. It has a shape that’s similar to charcoal kettle grills but has a 1500-watt heating element that cooks your food on 176 square inches of cooking space. The large lid lets you keep the heat in, and it locks in place for easy carrying. There's a vent on the lid to help you control the temperature as you cook. When it comes to aesthetic value, the grill and pedestal have a bright red powder-coated surface that will look good for years. Users liked this grill but noted that the assembly instructions were confusing since they covered several different models, and not all of the included assembly parts were required. 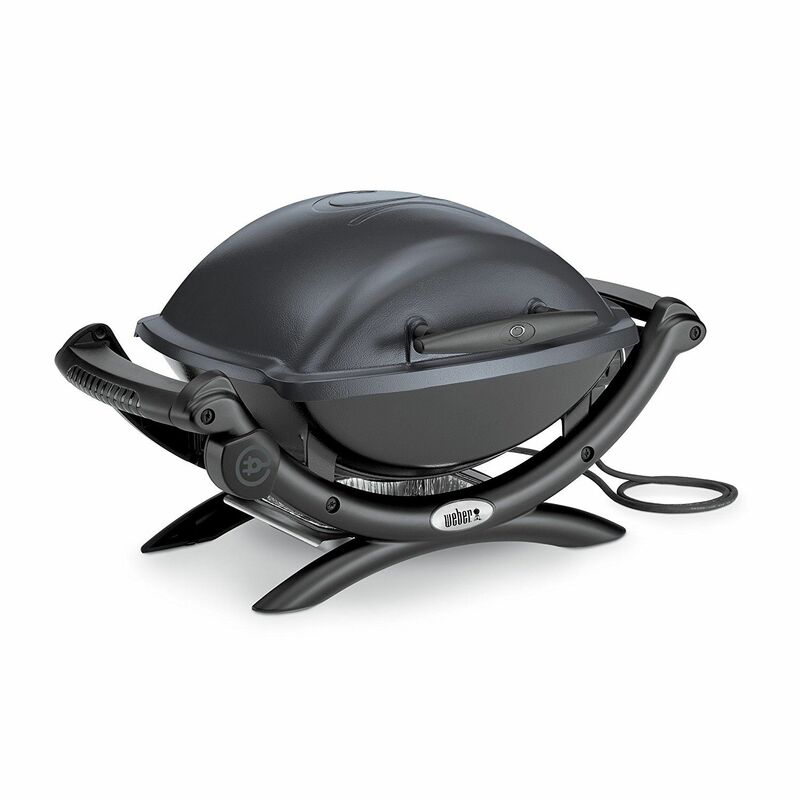 Some users noted that the electric element can be removed to use this as a charcoal grill. This is for outdoor use only. Our reviewers spent 10 hours testing one of the most popular electric grills on the market by setting it up, cooking meals, and cleaning it. We asked our testers to consider the most important features when using this electric grill — from its size to its performance — and have outlined the key takeaways here so that you, too, know what to look for when shopping. Size Some electric grills are designed for just one or two people, while others are large enough to cook a meal for the whole family. Neither is better — it just depends on how you’ll use it. The overall size of the grill is also something to consider since it’s likely you’ll store it indoors when it’s not in use. 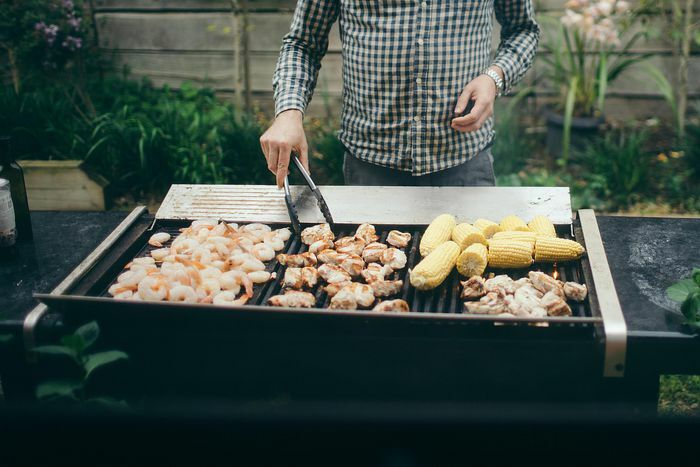 Indoor vs. outdoor Most people think of outdoor cooking when it comes to grilling, but some electric grills can be used indoors too — which is great when the weather isn’t cooperative or you need to stir a risotto on the stove and have a steak on the grill. If you’ll be grilling indoors, choose a grill that can live on your counter as well as your deck. ﻿Wattage and temperature If high-heat cooking is important to you, look for grills that can provide that heat reliably. 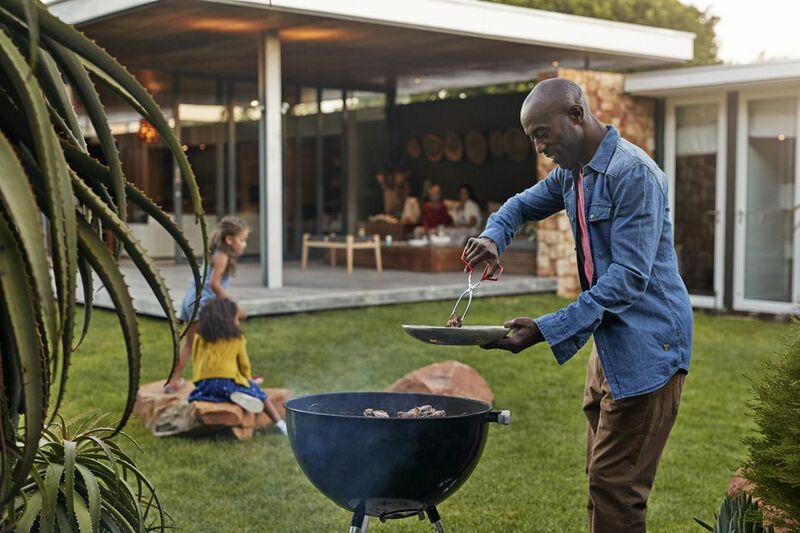 If you’re more interested in cooking over lower or moderate heat or using indirect-heat cooking methods, consider a grill with the ability to adjust the heat to your desired level. One of our testers made all the classic foods on this grill, including hot dogs, burgers, and chicken. According to her, everything “cooked nicely” across the board. She also highlighted the grill’s compact size and noted that it was easy to use once it heated up. However, a drawback for one reviewer was that the grill was difficult to clean. To make sure you don’t run into the same problem, have a metal grill brush at the ready.